Did you know that per statistics in the 2017 IRS Data Book, there were about 14 million delinquent taxpayers at the end of 2016 and 2017? That means that the IRS has identified 14 million people who should have filed tax returns but did not. With that said, falling behind on filing your taxes is something that happens to many people. File even if you don’t think you owe. If you were employed with wages and had taxes withheld from your paycheck, it is possible that you may not owe the IRS at all. This will depend on the amount withheld from your wages and any other deductions you may have (mortgage interest, etc.). If you have refunds, you should actually receive those for the last three years’ returns UNLESS you have amounts owed for other years. In that scenario, the refunds will be applied to any balances due for the other years. File original returns to replace IRS created returns. Sometimes, when you don’t file a return, the IRS files one for you. In IRS terminology, this is called a Substitute for Return (SFR). Our experience has been that a SFR is the worst tax return ever! It reports the income that shows up on W2s and 1099s but doesn’t give you any deductions or exemptions. You may already have a bill from the IRS that was created in connection with a SFR. The good news is that you can correct these returns, and possibly lower the associated tax and penalties, by filing an “original” return. Secure your IRS transcripts. Your records are supplemented by securing the IRS transcripts that will show what has been reported to the IRS. Basically, you want to make sure you report everything the IRS has for your SSN, otherwise, they will send you some notices claiming that you under reported income. Getting the transcripts will cross-check your records, filling in anything that is missing. The appropriate transcript to request is called the Wage and Income Transcript. You can get it via this page on the IRS website and you can request it online or you can use Form 4506-T to request it via mail. Review the past six years of activity. If you have six or more years of unfiled returns, make sure you do the above two steps for each year. Why? In most cases, the IRS requires the last six years’ tax returns to be filed as an indicator of being current and compliant. This is per Policy Statement 5-133 and Internal Revenue Manual 4.12.1.3. As such, make this your starting point of your analysis. Review other sources of income. The IRS transcripts are a checking point, but you will also need to check for things that aren’t reported on them. For example, if there is income you earned that is not on the transcripts (e.g. cash payments), you need to make sure you calculate it and include it on your return. Review your business income and expenses if you’re self employed. Income can be recalculated using several methods, including 1099 reporting to the IRS or your bank deposits. Working with this number, determining what you spent to generate that income. When done, take a look at what is left (i.e. the profit). You can then compare that number to what you spent for that year to live (e.g. rent, mortgage, utilities, etc.) to make sure it appears reasonable/logical. Too often, we see tax returns where there is no business profit, which then begs us to ask “so just how did you live that year?” Rest assured, if we can ask that question, the IRS WILL also be thinking of it too! Negotiating solutions for any balances due with the IRS collections division. To perform the second step, one has to prepare a financial analysis of their situation and present it to the IRS. This involves a review of your current income, living expenses, property and debts. It is often the case that the amount owed on unfiled returns cannot be repaid. So performing this analysis will help you determine if your “resolution” will ultimately be to enter into a payment plan, request an offer in compromise, or have your account be put in an uncollectible status. Consider filing the returns separately if you’re married. If you’re married, but only one spouse was responsible for creating IRS debt, strong consideration should be given to filing a separate return. Filing separately can limit who the IRS can collect from – protecting the non-liable spouse. File your returns in person if possible. 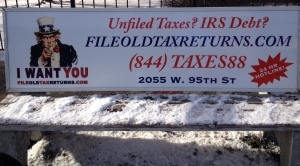 If possible, the unfiled returns should be hand-filed at an IRS Taxpayer Assistance Center. Note that the centers are by appointment only so you will need to schedule it via the previous link. If you bring an extra copy to the center, you can get it stamped by the IRS as proof of filing. If you are working with an IRS Revenue Officer, the returns should be filed directly with that person. It can take the IRS several months to process the returns. But if you file them directly with their personnel, it can speed up the processing time, which will then “stop the clock” in terms of certain penalties. If you owe money, the next step is to enter into one of the 10 resolution options solutions to solve your IRS tax debt as discussed on our sister site. 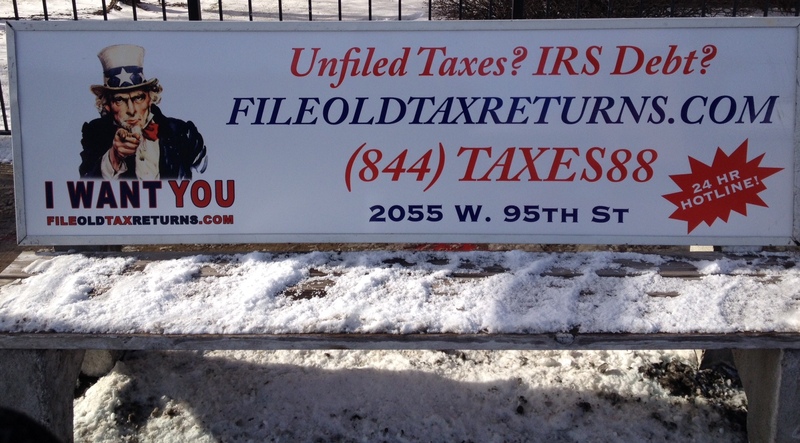 Even in the dead of winter, we’ll file your old taxes! If you’ve missed the April 15th deadline but for whatever reason, you STILL need to file your tax return, you might be a little confused as to what to do. Do you need to mail it? Can you send it in via E-File? Keep reading to find out your options. Find an Authorized E-File Provider. File Old Tax Returns is an authorized E-File Provider via Wilson Rogers & Company, Inc. We can gladly help you in preparing, filing and transmitting your current year tax return. Well, that means that you’ve missed the E-File window and your only option is to mail a paper copy of your return to the IRS. Gather your supporting documents. Look for your old tax documents, such as W-2s, 1099s, or 1098s. You will need these documents to file your return(s), as the IRS will expect you to report on your return what was reported to them via these forms. Prepare your return(s). This is where the rubber meets the road. The three steps that we outline under preparing your return before E-File shuts down apply here. You can use the IRS fillable forms, find prior year software or hire a tax professional. If you want to know how our process works, just download these instructions or give us a call at 844-TAXES88 (844-829-3788). For filing back taxes, you should seriously consider hiring a tax professional. Since you are already late on filing, it would be in your best interest to file accurate returns the first time. This way, you don’t have to worry about a bunch of back and forth with the IRS asking you to make corrections via dozens of letters to your house. A tax professional can also help to ensure that all of the deductions and credits applicable to that year are applied to your return. Remember, tax law changes each year and remember what was applicable in 2007 in 2015 might be a bit of a stretch. But services such as ours always retain the applicable reference literature so that we can prepare an accurate return, not matter how many years late it is being filed. Mail In Your Return. In this post we tell you the addresses where you can send your old tax return once you’ve finished preparing it. Note that you must send it to a different IRS Service Center depending on 1) if you are sending them money or not and 2) where you live. Address any balances owed. This post from our sister site discusses how to deal with any outstanding balances. Our basic recommendation is to 1) respond to any IRS or state correspondence, 2) assess what options are available to you and 3) enter into an appropriate resolution. Once you’ve filed the returns and addressed the balances (if any) you are ready to move forward. Just make sure that you remember to file your returns going forward or you’ll find yourself reading this post all over again!